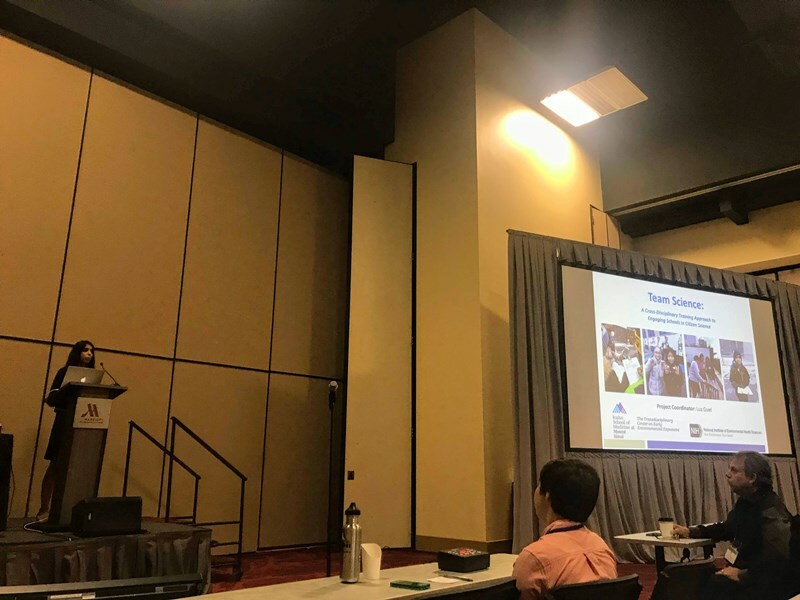 Our Project Coordinator, Luz Guel, presented our collaborative project “Team Science: A Cross-Disciplinary Approach to Engaging Schools in Citizen Science” in the Youth Education Session at the Air Sensors International Conference (ASIC) on Sept. 13th. ASIC brought together stakeholders from academia, government, communities, and commercial interests to promote and advance air pollution sensors, improve the data quality from these sensors, expand the pollutants measured, and foster community involvement in monitoring air quality. During the session, Luz shared how Team Science can be utilized as a replicable training model to empower urban educators and their students. Luz highlighted how NYC teachers and students collected and analyzed air quality around their school community using AirBeam monitoring devices and as a result gained an understanding of the interdependence of economic, environmental, public health and social justice factors around air quality. To read more about the conference and the UC Davis Air Quality Research Center click here. This entry was posted in Feature of the Month on September 18, 2018 by mountsinaitceee.